Mick Fanning "2018 Surf Champion"
PHOTO: Mick Fanning with Taylor Knox at Huntington Beach Pier 2016. They call him White Lightning. A speedy, towheaded regularfoot from Australia’s Gold Coast, Michael Eugene Fanning’s surfing blends razor-sharp precision with a light-footed radical approach. Groomed on the endless lines of the Superbank, Mick Fanning quickly zipped his way to surf stardom despite a life riddled with loss and adversity. Born in a landlocked suburb of Sydney in 1981, Fanning first surfed at age five but didn’t make it a regular pastime until age 12 when his family moved to Tweed Heads. From there, well, it was on. In 1999, he won the prestigious Pro Junior at the Australian Nationals. 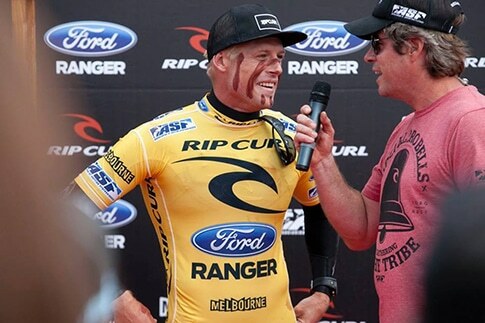 Two years later he earned a wildcard spot into the Rip Curl Pro Bells Beach and won the entire event, dedicating his victory to his late brother Sean who died in a car accident in 1998. That same year he topped the World Qualifying Series rankings to earn his permanent spot on the World Championship Tour. Fanning amassed 22 World Tour victories and 11 Top 5 finishes over his illustrious 17-year career. Not to mention, three World Titles (2007, 2009, 2013). Each of these crowns were won in dramatic fashion but his fourth Title run in 2015 was thwarted by a series of adverse events. During the finals at the Jeffreys Bay Pro in South Africa, Fanning was attacked by a great white shark. Miraculously, he survived without a scratch but the media attention in its wake was nearly overwhelming. Nonetheless, Fanning was leading the rankings headed into the year’s final event — the Pipe Masters. The morning it was set to go down, Fanning was awoken with tragic news — his older brother Pete had just passed away. After a morning of mourning, a steadfast Fanning put on his singlet and went out to compete. He won a super heat against an in-form Kelly Slater and John John Florence in firing Pipeline surf. Despite losing the world title to Adriano De Souza, Fanning credits that single heat win as the pinnacle of his career. With his induction today, he’s now permanently enshrined among a host of other legends, forever living on as a true Surf Champion. PHOTO: Courtesy of WSL. Photographer Cestari. 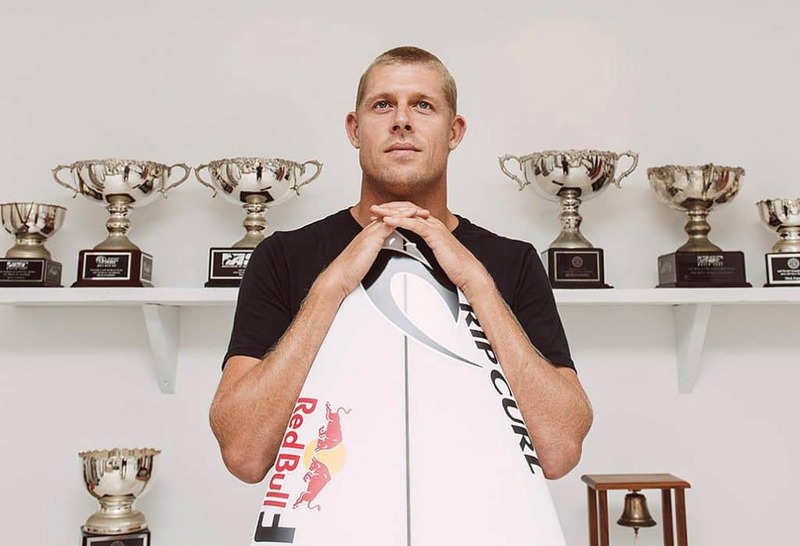 PHOTO: Mick Fanning with only a few of his trophies. VIDEO: Mick Fanning could not make our 2018 Surfing Walk of Fame Induction Ceremony for Surf Champion, but sent this video as his acceptance and appreciation of the award.